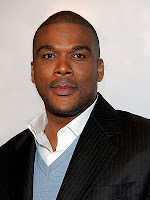 AAEA Hollywood: Tyler Perry Number One With "Why Did I Get Married?" Tyler Perry Number One With "Why Did I Get Married?" Tyler Perry is being touted as the next coming of Spike Lee. But Perry is probably a bit more ambitious than Lee. He wants to own a network by 2012. And at the rate he is going no one would be surprised. And he has Oprah Winfrey squarely on his side. He also provided a comeback vehicle for Janet Jackson, whose last two albums did not perform very well. But Janet is a multiple threat and notice how she bounced right back in another genre. Talent. "Why Did I Get Married" opened at number one with $21.5 million and notices are highlighting that he did more money than the openings of George Clooney and Mark Wahlberg combined. This is Perry's third hit movie and Hollywood will respect him because he makes money. "Madea's Family Reunion" opened with $30 million and did $63 million. "Diary Of A Mad Black Woman" was made for $5 million and did $50 million. Hey Tyler, how's about giving a shout out to the African American Environmentalist Association in one of your films?